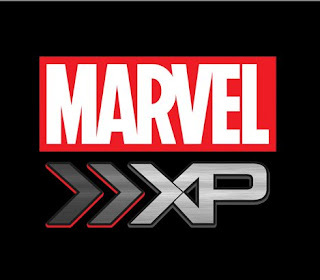 Marvel XP stands for marvel xp awards, these are available when you have reached different certain game requirements.It contains news about the game, statistics on a player's own game play, and unlocked dossiers and awards. The stories of the games connected to Marvel XP are interconnected with each other that began with Marvel: Avengers Alliance, then continued by Avengers Initiative. 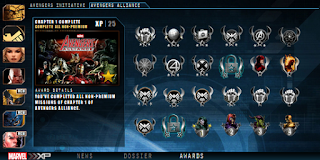 In addition, the rewards are also connected in a way that playing one of the games in Marvel XP will reward the players content in other games. In Marvel: Avengers Alliance, Marvel XP can only be accessed in the Facebook version of the game, as this feature is not available in the Playdom.com version. 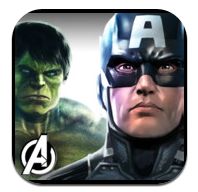 Connect Marvel XP with Marvel: Avengers Alliance? Marvel XP is accessed via the Marvel XP button at the top of Avengers Alliance. Signing up is automatic, but requires creating a login with a valid email address. Users who have entered an incorrect email address or who wish to activate email reward may use the following link: https://mgu.disneyis.com/mxp/index.html?did=***********#/login . Replace the asterisks with your USERID found at the bottom of the MAA game screen. The News Bulletin Section of Marvel XP. This section contains in-game news explaining more details about the story of the game. Dossiers contain write-ups of characters and organizations, as well as stats on characters encountered in the game. They are unlocked by purchasing Heroes or through encounters in missions. There are 133 dossiers to unlock. Awards are given to players for achieving different kinds of feats in the game. Some Awards are unlocked by finishing certain missions or finishing a certain amount of missions, other Awards are unlocked by recruiting heroes. These Awards are found in the Marvel XP section of the game. The Awards do not give any item or Gear in exchange for unlocking them, but contributes to leveling up in Marvel XP, which provides silver, shield points, and gear. There are 30 different Awards that can be unlocked throughout the game. Reward: Man's Mark 5 Armor Uniform. Fantastic Fix ??? ??? ??? Whenever you go to marvel xp at the bottom of the screen is three buttons. from left to right they are news, dossiers, and awards. If you click the awards button you will see a bunch of silver things. If you click each one it will tell you the objective for that award and xp for completing the objective. Once that objective is completed, you will get XP. Enough XP gained, and you level up. For example: An objective is "Complete chapter 1." If you complete chapter 1, you will get 25 XP. How do I recover my Marvel XP username and/or password? In order to recover your username or password you will have to use the in-game password recovery forms. Marvel Xp shares its log in information with www.Disney.com ,www.ABC.com , and www.ESPN.com. You can use those pages to recover your password/username as well. Please note, Playdom is not able to assist your with recovering your Username or Password. If you found this post helpful, please recommend and plus this post. You can contribute through comment. Thanks. So If I have done all these achievements already, do I have to do them again to get credit? i dont see any button 2 play any chapter..
is there anything to play in there?? How to play marvel Xp? You are already playing it when you play alliance. So what ever you achieve in there is counted towards Marvel XP. To check yous stats you click on the XP button in the tabs by your messages. ok... but in the awards, we have a tab with avengers iniative and other with avengers allinace. In the alliance i achieved almost all rewards but in the iniative i have lots of awards to win. And i'm in level 6, without doing anything in marvel xp, how do i level up? I am in level 6 but i only have the boots. I suppose to own 10 CPs right? I never got any CP. or these rewards should be claimed.. HOW? "Replace the asterisks with your USERID found at the bottom of the MAA game screen"
does this place even reply???? no reply from here and no reply from marvel XP when mail!!!! What is task master boss???? ?4m which mission it is to be played??? 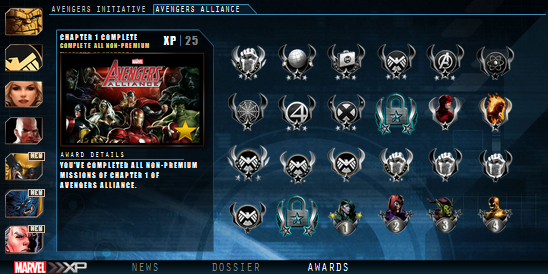 if i've already unlock all avenger alliance awards , how else do i gain more exp at marvel xp ? and i dont play on iphone or android.. means i will never gain exp from completing awards while playing on iphone or android.. easy saying, put aside avenger initiative.. the thing is, how else beside avenger initiative do i gain exp for marvel xp after i've unlock all awards of avenger alliance ? Some tasks and missions in Marvel Initiative unlocks features and heroes on Marvel Avengers Alliance. Example is Mockingbird, you'll unlock her when you're playing it or even win Iron Man's alternate costume for free.